Several recent review articles on amino acid analysis should first be mentioned here. Morr and Ha (1995) reported in general terms on analysis of protein and amino acids in food products, whereas Rutherfurd and Moughan (2000) focused on analysis of animal feeds. Molnar-Perl (2000) described chromatographic techniques for the determination of sugar, earboxylie acids and amino acids in foodstuffs and included references to techniques such as gas chromatography and capillary electrophoresis. Fekkes (1996) and Walker and Mills (1995) reported on advances in amino acid determination in physiological samples or biological fluids, respectively. Detailed descriptions of different chromatographic techniques were given, with examples of the degree of separation obtained. The chromatographic separation of all amino acids by means of a cation exchange column (polystyrene sulphonic acid as Na+ or Li+ salt) eluted with three to five citrate or sometimes acetate buffers of different ionic strength, pH and with different modifiers, was developed way back in 1948 and automated by Spackman et al. as an amino acid analyser in 1958. More than 50 years later this method had become the standard in amino acid analysis owing to the outstanding and stable separation, which allows the analysis of more than 45 amino acids in blood plasma (lithium buffer), the high reproducibility of retention time and peak area and the extended stability of the calibration. The resin is highly resistant to matrix effects, which is of major importance given the complex composition of compound feeds. Any increase in pressure due to soiling or a reduction in the separation performance can in many cases be corrected by simply reversing the flow direction; in the author's laboratory ion exchange columns are often operated continuously for more than a year; they are then cleaned, the resin regenerated and the columns repacked. The running costs of an amino acid analyser are therefore far lower than using RP-HPLC columns, which do not allow regeneration and are susceptible to attack by fats and non-polar components in feedingstuffs and therefore need to be changed frequently. Postcolumn derivatiza-tion is carried out either with ninhydrin in a heated coil or with OPA, the latter reagent being about 20 times more sensitive. The key advantage of postcolumn derivatization is that each amino acid, be it from sample or standard, is always derivatized under identical conditions in the respective elution buffer, which explains the high reproducibility. Moreover, amino acids in the underiva-tized state are ehromatographieally more strongly differentiated than the derivatives of conventional HPLC precolumn derealizations, where a very large non-polar molecule is bound to the amino group. Also, this reaction inevitably takes place in the respective matrix, which can influence the reaction yield and stability of the derivative. Butikofer et al. (1992) conducted a collaborative trial comparing HPLC analysis after precolumn derivatization with a mixture of OPA and 9-fluorenylmethyl chloroformate (FMOC) as an alternative to the classic ion exchanger in dairy products and feedingstuffs; although the means obtained with both methods were similar, IEC delivered greater reproducibility and precision and was recommended for cases requiring high precision. As IEC equipment technology is mature few articles with details have been published. Grunau and Swiader (1992) and Moeller (1993) used IEC columns in HPLC machines with two- or three-buffer gradient elution; Le Boucher et al. (1997) subjected the Hitachi L-8500A, a new amino acid analyser, to intensive tests with biological fluids for performance in peak reproducibility, retention time stability and linear concentration, with good results. The separation of amino acids by means of anion exchange chromatography was also tested, often combined with pulsed ampero-metrie detection (PAD). This separation principle is interesting because the elution sequence is reversed compared with the cation exchanger, i.e. arginine and lysine elute after a short time. PAD with a gold electrode covers oxidizable organic groups, e.g. compounds containing hydroxyl, amino and sulphide groups, but not inorganic salts or carbonic acids. Martens and Frankenberger (1992) successfully applied this new method to different proteins and wheat varieties, with adequate separation and reproducibility, although the detection sensitivities for arginine (high) and glutamic acid differed by a factor of 30 and the baseline of the ehromatogram is very unstable. Simonson and Pietrzyk (1993) systematically tested the effect of the anion in the separation buffer used for separating efficiency and sensitivity in the alternative indirect photometric detection (IPD) method. Jensen and Hofler (1999) of the equipment manufacturer Dionex successfully employed anion exchange chromatography in a recently developed device with PAD for analysing meat products, fermentation solutions and fruit juices. Casella et al. (2000) tested cheese samples and found detection limits of 5-30 pmol absolute and sufficient linearity of detection. Jandik et al. (2000) managed to improve the resin-related short retention time of arginine and tested soy hydrolysates, and De Bruijn and Bout (2000) tested sugar beet, but had to remove a large proportion of the sugar as it interfered with the detection. Jandik et al. (2001) used a cation exchange column in hydrogen form for this purpose, which retains amino acids while allowing sugars to pass. After a development time of over 8 years, anion exchange chromatography has still not gained widespread acceptance in feed analysis. Few authors achieved the separation of underivatized amino acids by means of RP-HPLC. Saurina and Hernandez-Cassou (1994) described in great detail an eluent system by ion pair chromatography and detected amino acids at 309 nm after postcolumn reaction with l,2-naphthochinone-4-sulphonate at 65°C. This method was employed for animal feed and powdered milks. Arlorio et al. (1998) also used ion pair chromatography to analyse aromatic amino acids and the associated biogenic amines in food products and sometimes found high concentrations in cheese. UV detection is sufficiently sensitive for these amino acids. The recently developed chemiluminescent nitrogen detector allows the specific and sensitive measurement of amino acids without derivatization (Fujinari et al., 1993; Bizanek et al., 1996; Petritis et al., 2001). 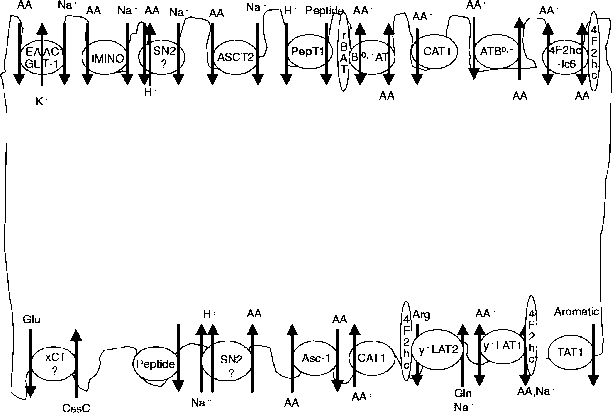 Pei and Li (2000) even described an amperometric sensor specifically for amino acids, which employs immobilized amino acid oxidase and was used for HPLC. The recently developed method of capillary electrophoresis (CE) in different separating media (CE, capillary zone electrophonesis (CZE), mieellar electrokinetic capillary chromatography (MECQ) for the determination of amino acids has also been extensively studied. Here the amino acid ions or derivatives migrate in the electric field through a separating capillary, for which a wide range of techniques have been described. Of these, only the review article by Smith (1997) on this separation technique will be mentioned and some recent papers which apply CE to the analysis of the amino acid composition of feedstuffs and skin (Michaelsen et al., 1994), or soy protein (Oguri et al., 1997), free amino acids in beer (Klampfl et al., 1998), or soy sauce and beverages (Soga and Ross, 1999), and of methionine and homocysteine in human plasma (Vecchione et al., 1999). After precolumn derivatization with non-polar, UV-vis- or fluorescence-active reagents on the amino group, all amino acids can be separated by RP-HPLC. This is of benefit especially in laboratories where amino acids are tested only occasionally as the HPLC equipment, unlike the amino acid analyser, is very versatile. New derivatization reagents are being developed all the time and can be protected by patents, which is a major advantage for HPLC manufacturers. The techniques dif fer mainly with regard to derivatization conditions (temperature, time, separation of the reagent), stability of the derivatives and detection methodology (cf. Table 2.3). The ideal reagent has not yet been identified and recent developments have so far not superseded established older methods. The long-established, slightly cumbersome (long reaction time, distillation for removal of excess reagent in a vacuum) derivatization with PITC was made commercially accessible by Waters as the Pico-Tag method using a dedicated apparatus. The PITC amino acids being formed, which are fairly stable in an acid environment, can eyelize to phenylthiohydantoin (PTH) amino acids in an alkaline environment (secondary reaction). The first-named derivatives are usually ehromatographed and detected under UV light. The follow-up products of eysteie acid and methionine sulphone can also be separated ehromatographieally after oxidation of the sample with performic acid. Table 2.3. Comparison of chromatographic methods of amino acid analysis. aIEC, ion exchange chromatography; HPLC, high performance liquid chromatography with reversed phase columns. bPITC, phenylisothiocyanate; OPA, orthophthaldialdehyde; FMOC, 9-fluorenylmethylchloroformate, AQC, 6-aminoquinolyl-W-hydroxysuccinimidylcarbamate, DABS-CI, dabsylchloride. for the analysis of free amino acids in plasma and other biological samples (Hagen et al., 1993; Hariharan et al., 1993; Bugueno et al., 1999; Campanella et al., 1999). Precolumn derivatization with OPA in combination with a thiol compound combines the advantage of a very rapid reaction time (1 minute at room temperature) with the specificity and sensitivity of fluorescence detection. Although secondary amino acids do not react, this can be avoided by the subsequent addition of FMOC after a complete reaction with OPA with the formation of FMOC-proline for example. The stability of the OPA derivatives is very limited, which is particularly relevant for the important amino acid lysine. This is why OPA derivatization should preferably be fully automated in the autosampler. May and Brown (1989), MolnarPerl and Bozor (1998), Molnar-Perl and Vasantis (1999) and Molnar-Perl (2001) systematically tested different thiols, reagent mixtures and derivatization conditions for yield and stability of the amino acid derivatives. In a collaborative trial, Biitikofer et al. (1991, 1992) compared the accuracy and reproducibility of OPA/FMOC precolumn derivatization in feedstuffs, milk/cereal mixtures and cheese with that of classic ion-exchange chromatography. According to their studies, the within-laboratory repeatability is comparable for hydrolysate analyses, but the sensitivity of fluorescence detection is 5-20 times greater depending on the amino acid, for lysine. Although the mean concentrations found in the ring test were approximately equal, the reproducibility was distinctly poorer for almost all amino acids, especially the limiting methionine, lysine and threonine, and across all samples. The feedstuff sample fared worst, which the authors attributed to matrix interference during the derivatization. Puehala et al. (1994) tested methionine sulphoxide and other amino acids in the rumen of cattle, Li et al. (1998) used the method for feed samples, Heems et al. (1998) for soybean cattle cake and beverages, Zunin and Evangelisti (1999) for infant formulas, Baek et al. (1999) for amino acids and biogenic amines in soy sauces and Herbert et al. (2000), and Pripis-Nieolau et al. (2001) for analysis of free amino acids in musts and wines. Other authors tested seafood for free amino acid concentrations (Vazquesz-Ortiz et al., 1995; Antoine et al., 1999, 2001). The method was also used for the analysis of free amino acids in blood plasma and urine (Van Eijk et al., 1993; Begley et al., 1994; Fekkes et al., 1995, 2000; Czauderna and Kowalczyk, 1998; Tcherkas et al., 2001). Another fluorescence-active reagent for precolumn derivatization is FMOC. It reacts quickly with all amino acids at room temperature, but more slowly than OPA. The derivatives are stable and analytical solutions can be stored for several days in a refrigerator. In the presence of water 9-fluorenylmethanol develops from the reagent, which is highly fluorescence-active and elutes in the centre of the amino acid chromatogram. For this reason an extraction step with non-polar solvents is required, a disadvantage if this cannot be done automatically in a special autosampler. Cottingham and Smallidge (1988) have used this technique with good results for the determination of total lysine in complete feeds and supplemented lysine in premixes. Fernandez-Trapiella (1990) tested methionine, cystine and lysine following oxidation with performic acid in soybean meal, meat meal, fishmeal and other feedstuffs and obtained equivalent results when compared with conventional IEC. Yet no further papers on feed analysis with FMOC have been published. Kirsehbaum et al. (1994a,b,c) determined amino acids and biogenic amines using this methodology, Arnold et al. (1994) analysed green coffee beans and Or-Rashid et al. (2000) and Sultana et al. (2001) tested free amino acids in rumen fluid. Assays in biological samples were also described (Ndibualonji et al., 1992; Ou et al., 1996; Or-Rashid et al., 1999). In 1993 the company Millipore introduced a new derivatization reagent, 6-amino-quinolyl-N-hydroxysuccinimidyl carbamate (AQC), which they tested against IEC for analysis of feed samples (Cohen and Michaud, 1993; Cohen and De Antonis, 1994). According to these studies, the highly fluorescence-active reagent reacts quickly with amino acids, derivatization is very simple to perform and the derivatives formed are stable for several weeks at room temperature. The authors described HPLC conditions which also separate cysteic acid and methionine sulphone from oxidized hydrolysates, and the reagent peak causes no interference. Liu (1994) tested the recovery of 14 amino acid standards added to a feed hydrolysate and found between 92 and 112% with a mean recovery of 98%, compared with IEC the recovery was 93-110%, except for threonine (85%) and arginine (117%). Indeed, he and some other authors heated the derivatization mixtures for 10 min at 50-55°C in sealed autosampler vials in a reaction block in order to finish the derivatization procedure. Liu et al. (1995) tested the methodology thoroughly in food and feed samples, ruling out interference from salt in neutralized hydrolysates. The depicted ehromatograms of broiler feed and maize show good separation of all amino acids in the oxidized hydrolysate. Good agreement with IEC is achieved in several samples, including for arginine and threonine. Van Wendelen and Cohen (1997) studied the separation conditions in collagen hydrolysates and cell culture media samples and designed an optimal quaternary eluent system. Reverter et al. (1997) used this technique to analyse blood plasma of swine, but were unable to achieve complete separation of all plasma amino acids with the dual gradient system employed. Miao et al. (2000) reported on analyses of various foodstuffs with 88-110% recovery of all amino acids. Another derivatization reagent, which has been around for some time, is dabsyl chloride, which is typically kept for 12 min at 70°C for conversion with amino acids and yields stable, coloured derivatives which can be detected with a photometer at 436 nm. Schneider (1989) of the company Beckman gave an overview of separating conditions and reproducibility of the technique, Dmevieh and Vary (1993) used it to analyse blood plasma samples, Ikeda et al. (1993) employed this reagent for the determination of hydroxypro-line and proline in collagen and Krause et al. (1995) tested amino acids and biogenic amines in biological samples and food. Also worth mentioning is the fluorescence-active, long-established reagent dansyl chloride which was used by Sanz et al. (1996) for the analysis of milk and egg protein, and two projects concerned with the analysis of amino acids in feed or plant raw materials after derivatization to volatile compounds by means of gas chromatography (GC-MS) (Oh et al., 1995; Muranszky, 1996).